A leftist professor wants the truth about two men killed during a hunting party; but the mafia, the Church and corrupt politicians don't want him to learn it. A conscientious factory worker gets his finger cut off by a machine. Although the physical handicap is not serious, the accident causes him to become more involved in political and revolutionary groups. A middle-aged plumber quits his job and questions his life after seeing somebody his own age suddenly die from a heart attack on his way to work. Party leader and power broker Aldo Moro, holed up with his cronies and rivals at a monastic retreat where they plot their political fortunes while being led by a Jesuit cleric in spiritual cleansings. A bank cashier, who's allergic to banknotes, quits his job after an armed robbery. He decides to start a new life, as a thief. He starts by targeting a popular former client, a butcher. But being a neurotic Marxist has its drawbacks. A chief of detectives, homicide section, kills his mistress and deliberately leaves clues to prove his own responsibility for the crime. Alfredo Martelli is picked up by the police at his apartment without justification. In the precinct, he slowly discovers what the investigation is about as we discover details about his life. A popular painter, plagued by nightmares that he and his lover/sales agent are engaging in bizarre, ritualistic, sadistic sexual acts, seeks to escape the city and rent a house in the country. A populist right-wing tabloid newspaper tries to derail the official police investigation of a brutal murder of a young girl in order to help the fascist and right-wing candidates it supports in the upcoming elections. Sicily is a small island. Some people live there. Some people love there. Some people die there. "A Ciascuno il suo" is based on the homonymous book by Leonardo Sciascia, and just like many of the author's books is an unconventional detective story aimed at unveiling the hypocrisy and immorality of Sicilian society. The story begins with a man showing his friends a few threat letters. A few days later he gets shot together with one of his friends, a chemist. The murder is filed under "honour crime" (delitto d'onore) a murder committed out of passion and jealousy, and a peasant is convicted for it. Gian Maria Volonté is an awkward school professor who believes in the peasant's innocence, and decides to investigate the crime. His infatuation with the beautiful wife of the victim also plays a part in his decision to solve the mystery. As the story unveils, he will discover unpleasant truths, but will continue with the investigation despite all dangers. Volonté is as formidable as always, changing his accent and posture to fit the part. But the real protagonist is the Sicilian landscape in all its harsh brightness. The cinematography is such that we can almost feel the wind, the sun and the dryness of the air. 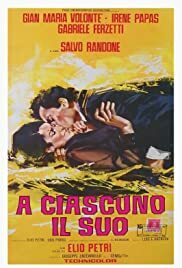 When I first watched this film I wondered whether anyone who was not Sicilian or familiar with Sciascia's writing would understand all its complexity, but Elio Petri does a masterful job in transposing the book.